There are a variety of costs and fees that come with the aged care process. The RAD, short for Refundable Accommodation Deposit is one such cost. Like many of the other aged care fees, RAD too can be confusing to understand as it so subjective and can vary greatly between different people. The RAD is like a bond for nursing homes and other aged care facilities paid by a resident before they go into care. The amount is usually payable as a lump sum. How much you need to pay will vary, depending on the aged care facility and on your individual financial situation as well. RAD is payable in full, within six months from the time the resident enters a care facility, or can be paid in instalments in the form of Daily Accommodation Payment. RAD is fully refundable, Government guaranteed and and will usually be paid back to the resident or their estate within 14 days of them leaving the facility. For the average person, figuring out the RAD can seem very confusing. A professional aged care consultant can help to make sense of the RAD and ensure all issues in relation to aged care costs are taken care of, without any extra hassle. Do You Need To Sell The Family Home To Pay The RAD? Paying the RAD for nursing homes or aged care facilities can seem like a huge financial burden when you first look at the sums involved. By working with a specialised aged care financial planner, your family can have the aged care RAD explained to you properly. Based on this, you can work out exactly how much to pay towards the RAD (if any) and how to fund it. In many cases, families opt to sell the family home to pay the RAD in full. However, there are other options you can explore. Calculation and payment towards the RAD can be complicated. So before you make the decision to put your family home on the market, seek aged care financial advice to determine the best course of action for your family. At Core Value we will help determine how selling a home will affect your loved one’s overall cash flow. Sometimes, selling a home affects your loved one’s means-tested aged care fees as well as age pension benefits. So selling a home may end up leaving you and your family with a bigger financial burden. We will look at all these factors and help you come up with the most suitable payment method for RAD, that will make sure that your family wealth is preserved, even during this emotional transition. The Core Value team is determined to ease the burden of aged care finances for you and will always advise you on the best strategies for your unique situation. It’s what we do every day and we’ve been doing it for years and are committed to helping our clients through this difficult time. 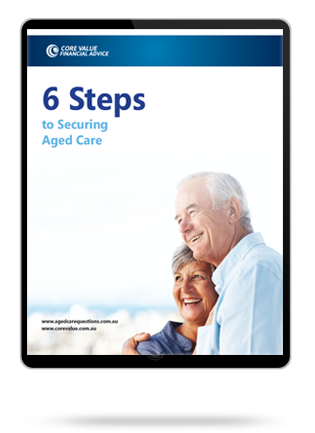 Get the expert advice you need on RAD and other aged care concerns. Speak to one of specialist financial advisers on 1300 944 011 today.